Dortmund’s tenure with Peter Stöger as manager has hit a low – to the tune of a massive six goal loss to Bayern in Der Klassiker. Bayern was loaded with attacking talent in their starting selection. Ribery and Robben were used on the flanks, with Muller and James playing more centrally. Muller, wearing the armband today, acted as more of a second striker with his positioning, while James had a great deal of freedom to move into spaces where he could influence the match. Most commonly, this would be in deeper spaces of the build-up, moving as far back as the centre backs at moments or the other side of Martinez. Starting Selections – until Castro was taken off after a half hour for Weigl. The Colombian’s drifting overall was not harmful to Bayern’s positional structures however, since they were quite adaptable to the movements of individual players. Alaba and Ribery formed a formidable duo on the left wing, in which Alaba spanned the wing, timing supporting movements and overlaps exquisitely as Ribery cut towards the middle when receiving the ball. On the opposite side, Robben was mainly situated on the touchline, with Rafinha moving towards the interior for stability purposes. The Brazilian was bold at some moments in which he moved into the halfspace on the same line as the attacking midfielders, getting cover from Martinez and James in midfield. Elsewhere in Bayern’s attack, Muller roamed predominantly centrally in free spaces, occasionally sliding toward the right when Rafinha moved forwards. With Lewandowski checking toward the ball sporadically, Muller replaced his vertical presence to prevent Dortmund from moving up their lines defensively. It was apparent that the positional influences from the Guardiola era at Bayern were found in their movements and occupations of the zones of the pitch, despite that trait somewhat disappearing from the club when Ancelotti was coach. The home side were quite balanced with their staggering and positioning (more on that later), giving Dortmund a series of headaches during the match. Dortmund set up their defense in a midfield block, hoping to recover possession off of intercepting central passes toward the attacking midfielders. From their base, which fluctuated between 4-4-2 and 4-1-4-1 (depending on the movements of Gotze), they were not stellar about providing consistent pressure to the ball and rushing the decision making from Bayern. Batshuayi was solo in his pressing efforts of the centre backs at moments, supported a handful of times by Pulisic and Schurrle, but the support was mainly symbolic. The two wingers didn’t display much intensity for how they followed the Belgian. Since the space surrounding Bayern was not effectively shrunk, these efforts had no consequences for Heynckes’ team. 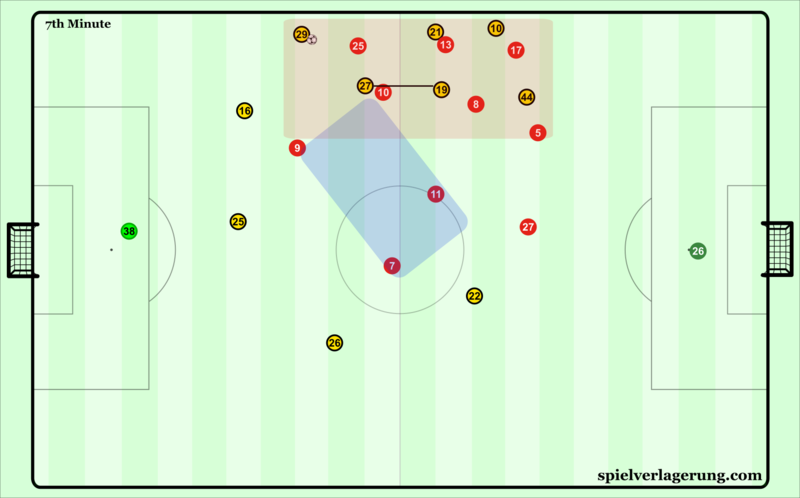 Instead, Dortmund were consistently reacting to the movements and attacks of Bayern. Pressure toward the ball was minimal, and while one player would move up to pressure, other players in that line would move back to cover. There was never really any cohesion about what Dortmund were doing defensively. Sometimes the attacking players decided they wanted to high press, so they moved up to do so. The midfielders wouldn’t react to this, and their lines would get broken quite easily. Once that first line was opened, that same group of players would hardly recover to help delay Bayern’s high energy attack in either the centre or the wings. It was almost as if Dortmund’s defensive line was reluctant to pressure the ball so that more numbers could recover, yet those numbers never came. This afforded Bayern’s attackers with large areas to play and move, making their chance creation look simple. With Bayern looking to play through the centre or meet the timed runs of three players in the penalty area via a cross, Dortmund were missing their reinforcements to deal with these attacks at regular intervals. Combined with a failure of legitimate contesting of the ball, the Bavarian’s were afforded too much time than what is acceptable to get any positive outcome from the match. Despite two of the goals being narrow offside decisions, Bayern were comfortable in how they moved up the pitch. It would be misleading to say that all of Dortmund’s struggles during the match were products of the opponent. Rather, a fair amount of the problems that BVB had were either directly self-inflected or characteristic of larger issues with their possession game. Some of the most glaring problems came during attack development, specifically with the relationship between Castro and Dahoud. Castro was put as the more defensive of the two central players, as Dahoud joined forwards more in order to combine with Gotze and Schurrle when applicable. However, Castro was frequently far too close to Dahoud on the left side. With Bayern setting up their press to win the ball in the wings, this made getting out of their press extremely difficult without having an option to switch the ball through centrally. Because of this, they were essentially caged into the wings. The only options were either to force passes into the feet of players surrounded by two or three players and magically expecting them to come away with the ball, or knocking balls long up the wing and chasing it down. Since it took a fair amount of time for Schmelzer to decide what was best, Bayern had ample time to adjust their defense and anticipate the following actions, making these on the fly solutions unsuccessful. Since Castro and Dahoud are on the same side, there is no central presence to change the point of attack from one side to the other. In addition, Bayern’s pressing on the wings because easier because of the limited space and poor structure from BVB. In the early moments of the match, Dortmund were concentrated on the wings, with the most prolific attacks coming from Pulisic and Piszczek on the right taking advantage from Alaba and Ribery’s advanced positions. Pulisic was the most promising attacker, being one of the few penetrative presences as he progressed the ball through his dribbling and found his teammates in the creative zones for them to potentially work with. However, the result from these was that Schurrle and Dahoud were mainly relegated to taking shots from outside the penalty area, which didn’t pose major concerns to Ulreich. Pulisic also targeted Batshuayi with early crosses aimed for the top of the goal area, almost registering shots on target early if wasn’t for the titanic duo of centre backs for Bayern. Since Dortmund’s attack was quick to go forward, this lead to odd structures at times where many players were found in the same line and subsequently easier to defend. There was not an impressive dynamic among players, with only small movements from their base positions and slow speed of circulation. Castro exacerbated this problem with his lengthy time to make decisions, and Bayern began to press him with lucrative results for the third goal. Shortly after, Castro was removed in favor of Weigl, who provided more stability and faster play in possession. Weigl still made a costly error that caused goal number five on the stroke of halftime though, so the young German, while offering an improvement to Dortmund’s play overall, was far from perfect. Since all of Dortmund’s players are on the same two lines, Castro has almost no quality options to pass to upon receiving the ball. Once James and Muller press him, they are through on goal and Bayern slot their third of the match. When the attacks were stuck, the far side full back would move forward into the play to offer a solution out to play on the other side. Schmelzer would start his runs from further back, electing to run onto the ball with the view of dribbling by the next players in the game using his momentum. His Polish compatriot on the other side started higher and wider, either overlapping or occupying the wing on his own, being a more advanced option to switch the attack into as Pulisic moved centrally to contribute to the play there. There was not much regulation as to when either one of them would go, so both of them were frequently caught higher up the pitch without adequate transition support. It was not all doom and gloom for BVB, as some good instances from their play came to avoid Bayern’s pressure, breaking free to create some promising attacks. While these didn’t ultimately lead to any goals, they played though Bayern at times in a way that few teams get to do, indicating that the player quality in Dortmund’s team is generally solid, despite a less than optimal set up for them currently. Ultimately, this match was decided in the moments when the ball was lost (or won in Bayern’s case). While the losers on the day were an example of how not to cope with a team with several strong counterattacking threats, Bayern were a paragon of how to counterpress and limit the opposition’s ability to counter. Starting with the bad first, Dortmund were quite irresponsible in their moments to send up both full backs. Considering Castro (or Weigl) and Dahoud were frequently advanced as a part of contributing to the attack, the distances between the centre backs and the remainder of the team were quite large. Once Ribery or Robben received the ball and were able to run at defenders, they were often numbers up, or at the very least, equal. Considering Bayern had superior attacking quality, these were advantageous situations for them and subsequently led to a series of threatening attacks. The poor transition play is also symbiotically tied to their play in possession as well. Since Castro was too leftward oriented towards Dahoud (as seen in the first graphic), the space in front of the centre backs was unoccupied, allowing Bayern to pass into this space upon recovering possession. For the first goal, Muller receives the ball and runs toward the defense with no pressure applied to him until he had run for almost 20 meters, since Castro was so far out of position. With the second graphic above, having three or four players in the same horizontal line makes counterpressing remarkably difficult. By staggering the shape of the team, the relative distances for each player to apply immediate pressure to the ball are smaller, giving more balance to the team when in possession but also making the burden to get back into defensive shape much smaller. Stöger has not instilled this into his team, and as a result, moments in which Dortmund lose the ball are cumbersome and cataclysmic since there isn’t consistently adequate pressure on the ball once possession is lost. On the other hand, Bayern were well prepared for these transitional moments, understanding that Dortmund would likely seek to exploit these situations if they were to get a result in the match. Through positional staggering, they were better equipped to apply counterpressure against their opponents. Similar to his role with Guardiola, David Alaba moved toward the centre as a screen to prevent passes up to the centre forward, while also being available to counterpress cleared crosses around the top of the box. Martinez offered another option of security, and as Dortmund dropped deeper and deeper, Bayern moved their defensive line higher, with Hummels aggressively stepping up to win the ball as Dortmund were forced further and further back as the half wore on. The positional structure that Heynckes employed on the day faciliated a dominant performance from the Bavarians, particularly in denying their opponents any possible counterattacks. Bayern’s staggering in possession makes it so once Muller’s pass is cleared, they can easily pressure the pass up to Batshuayi. Once they win the ball, they can continue attacking in their opponent’s half. After a 5 goal first half, the second half is essentially pointless. Lewandowski finished his hat trick just before injury time, but nothing in the second half is significant to the flow of the game overall as both teams waited for the final whistle. Bayern are set to win the title, with next weekend being the most probable weekend for the crowning to be official. From Dortmund’s perspective, this match is damning evidence that Stöger is not the manager to take Dortmund back to the levels the club experienced under Klopp and Tuchel a short time ago. Bayern were generally more cohesive and responsive to events in the match, leading to intensity differences that were overwhelming for Dortmund. Each club looks to the future to hire a new head coach for next season. In the meantime, Dortmund aren’t in total crisis. They still have strong players who are misguided and playing a style not appropriate to their strengths as a squad. Of course some changes will be made, but they are still in a decent place. Bill , Disagree with you about how Chelsea would have been ruthless especially when it comes to Bellerin. I mean they refused to sell Christensen, Courtious(even the year he struggled) and several other quality youngsters for less. Chelsea are really good at buying players and selling those that don”t fit. For instance, Salah, De Bruyne, Schurrle they bought, didn”t fit and sold. You talk about Bellerin not being that good and what not but again, look at the clubs that are chasing or chased him last summer: Juve, Barca, Madrid and Citeh, I think that says something not only about his quality but how highly rated he is. Welp, thats its for me, Im off for day, until tomorrow.